Word-of-mouth is without a doubt the oldest and one of the most successful forms of advertising. Customers tend to trust recommendations from people they know, because these people stake their reputations on recommending a product or service. Think about it: have you ever bought something that was recommended to you by a friend? Or visited a review site and bought the product which had the most positive reviews? Listening to what other people have to say about products and services is something we do on a regular basis—we all want to spend our hard-earned money on the most valuable and reliable products. That’s why many businesses have learned to take advantage of the incredible power of word-of-mouth marketing. Have you? Why Should You Master Strategic Word-of-Mouth? 74 percent of customers think that word-of-mouth is a key influencer in their purchasing decisions. The conclusion here is simple: people don’t trust brands they don’t know—they trust personal recommendations from their friends and relatives. For both B2B and B2C customers, testimonials and reviews will increase your chances of success. Essentially, word-of-mouth marketing is all about stimulating conversation around your business. By building a strong image through superb service and excellent products, you can turn your customers into brand ambassadors. Why are we mentioning the words “superb” and “excellent” here? Because word-of-mouth won’t be triggered if customer experience doesn’t go beyond ordinary service. As Entrepreneur wrote, “slightly exceeding their expectations just won’t do it.” You as an entrepreneur should go above and beyond if you want to inspire talk about how great your business is. You’re probably a little bit confused right now, but listen to this: if you promise exceptional service (or whatever you’re counting on to start word-of-mouth), it will eliminate the possibility of your consumers becoming the ambassadors of your brand. Why would someone repeat your words about your company when talking with family and friends, right? Let them do it! This means that your actions are stronger than your words. Customers are so used to hearing promotional stuff from brands that they tend to tune your words out. That’s why businesses are often more successful when they focus on doing great things without talking about them a lot. There are lots of examples of non-verbal statements that triggered word-of-mouth. For example, when McDonald’s began constructing playgrounds attached to their restaurants, this news quickly spread among parents and the number of customers visiting them with children increased. If your business cannot afford something that elaborate, there are lots of more affordable ways to achieve word-of-mouth. For example, you could allow your customers to select one freebie to go with their order or replace some inexpensive parts of your products (like batteries in watches) for free. Or Sending them a client welcome package! These are the kind of things that customers may mention the next time they’re talking with their friends. In many cases, businesses make a mistake by not investing a proper amount of funds into word-of-mouth strategy. It should be clear that going above and beyond for customers requires some additional investment, so your budget should be planned accordingly. An experienced marketer knows that word-of-mouth strategy has a significant business power. Indeed, just one satisfied customer could provide dozens of new customers by recommending your business as an outstanding one. However, this should not make you think that word-of-mouth is an easy and quick way to fix all problems. Like any other good marketing strategy, it is a marathon rather than a sprint. 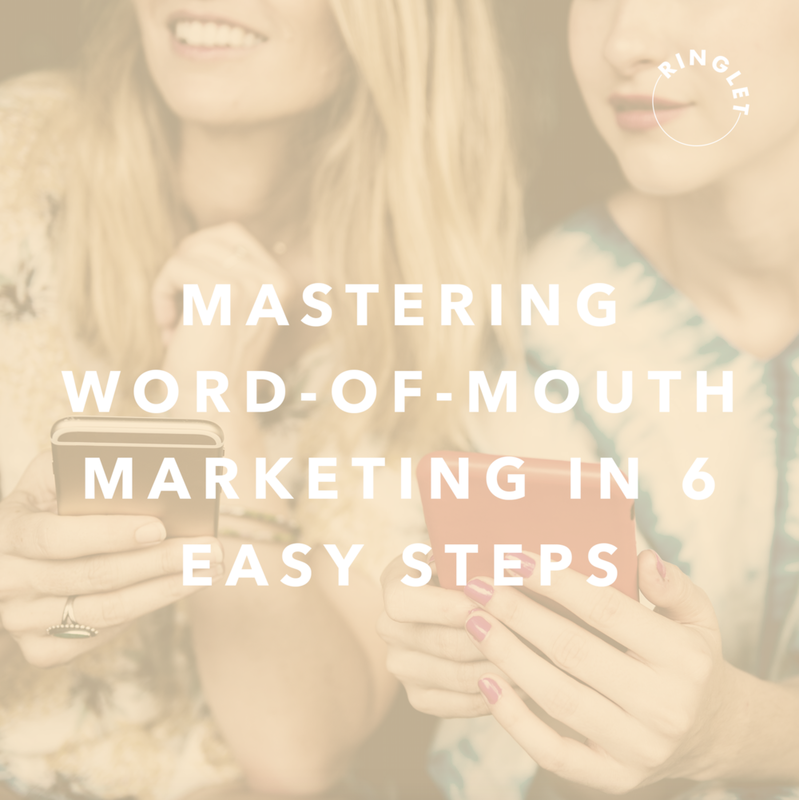 The six steps below will help you develop an outstanding word-of-mouth marketing strategy. An influencer is a person who has established credibility in a particular industry. By sharing content via the many influencers on social media, brands believe that it makes them look more reliable in the eyes of customers. However, a brand can become a thought leader as well. Establishing your credibility requires some effort; for example, you’ll have to keep up with the latest news and trends in your industry to make reasonable predictions about what to expect in the future. The path to thought leadership is far from easy, but if people perceive your brand as the one they can trust, they will be eagerly waiting for your new products, services, and content. Ex: Starbucks’ annual #RedCupContest is one of the best examples of how brands effectively utilize user-generated content. According to the 2017 Local Consumer Review Survey conducted by Bright Local, 97 percent of online shoppers read online reviews for local businesses last year. Moreover, 85 percent of them trusted online reviews as much as personal recommendations. Remember how we discussed social media influencers above? Well, if you’re struggling to attract the attention of an online audience, using them may be a good idea. To begin, make a list of influencers in your industry. Then think about which ones would appeal to your target audience the most, and ask them to collaborate. If they agree, feature the influencers in your business or on your website and social media in a prominent way. How can you persuade distracted or lazy consumers to do you a huge favor? Offer the proper incentives. Use coupons and develop different referral programs to encourage word-of-mouth. In addition, reward your biggest fans and regularly reach out to people who are talking about you to make sure everyone feels appreciated. Step 6: Provide that exceptional experience! For the tips in this section to be truly effective, make sure that you’re providing the exceptional experience I talked about above —“exceptional service” should always be the cornerstone of your word-of-mouth marketing strategy. Presto!! We know it's a lot of take in but the potential for growth here is HUGE! If you need a helping hand, don't hesitate to reach out to us! Marketing is our JAM and we'd love to help! Sign up with your email address to receive RINGLET’s Friday morning emails. Jun 27 Is Your Business Sending A Consistent Message?